The use of arterial spin labeling (ASL) for assessing myocardial perfusion has several advantages over existing techniques. ASL does not rely on contrast agents, can achieve arbitrarily high resolution, and is naturally quantitative. ASL is widely used for assessing cerebral blood flow. However, its application to myocardial blood flow has been limited [1, 2]. Current subtractive methods suffer from artifacts stemming from high LV blood signal including Gibbs ringing and mis-registration. In this work, we investigate the use of background suppression (BGS) [3, 4] in the context of ASL cardiac perfusion imaging using flow-sensitive alternating inversion recovery (FAIR) . Experiments were performed in five healthy volunteers on a GE Signa 3.0 T EXCITE scanner. The FAIR-BGS pulse sequence is illustrated in Figure 1. 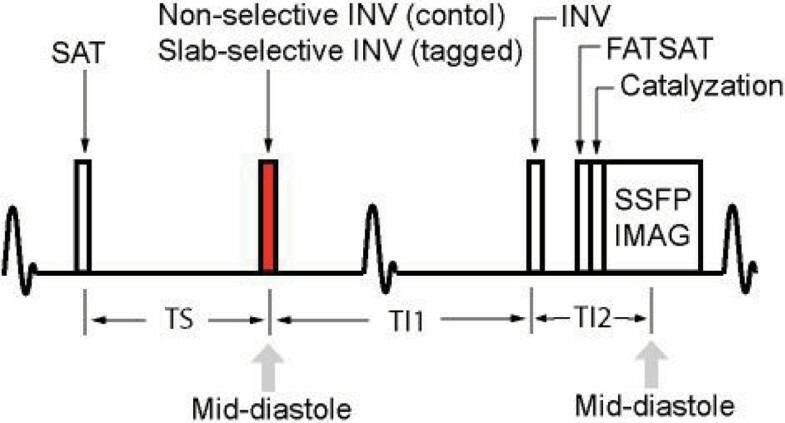 BGS was achieved using a saturation – inversion – inversion preparation scheme that suppresses signal from a broad range of T1s including myocardium (1000–1200 ms) and blood (1400–1600 ms) at 3 T . Adiabatic pulses (BIR4 and hyperbolic secant) were used to reduce sensitivity to B0 and B1 inhomogeneity. Cardiac-gated FAIR imaging was implemented by alternating the first inversion pulse between non-selective and slab-selective to generate control and tagged images respectively. A snapshot SSFP acquisition is used for its high SNR efficiency. Imaging parameters were flip angle = 40°, TR = 3.2 ms, FOV = 20 cm, matrix size = 96 × 96, and slice thickness = 10 mm. Perfusion rate is calculated using: f = (MTagged - MControl)/(MO·RR·(1-exp(-TS/T1))·exp(-(TI1+TI2)/T1)). The first inversion and imaging are fixed to occur at the same cardiac phase (mid-diastole) so that the inversion slab contains the imaging slice, and the calculated perfusion rate provides the average perfusion rate over one heartbeat. Proposed cardiac ASL pulse sequence timing: flow-sensitive alternating inversion recovery (FAIR) with background suppression (BGS). Fig. 2a–d contains a baseline image (no preparation), BGS control image, BGS tagged image, and difference image (tagged – control) from a short-axis view in one representative subject. 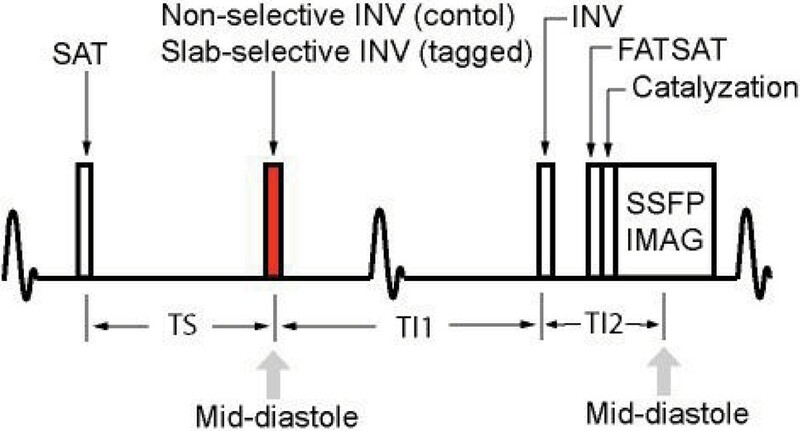 Using conventional prescan calibration, blood and myocardial signals were suppressed to <3% of their equilibrium values. We found that by calibrating TI2, the residual signal could be further reduced to <0.7% of equilibrium values, although the optimal TI2 varied for each region of interest (see Fig. 2e). Ventricular blood signal in tagged images was also reduced to 20% of its equilibrium value. With the adjusted TI2 we acquired 4 control and 4 tagged images in individual breath-holds to measure myocardial perfusion rate. To improve SNR, a single ROI containing all myocardium was used for analysis (approx. 100 pixels). The calculated perfusion rate had a mean ± SD of 1.52 ± 0.45 ml/ml/min. Note that the typical literature values for MBF in healthy myocardium is 0.8 ml/ml/min. 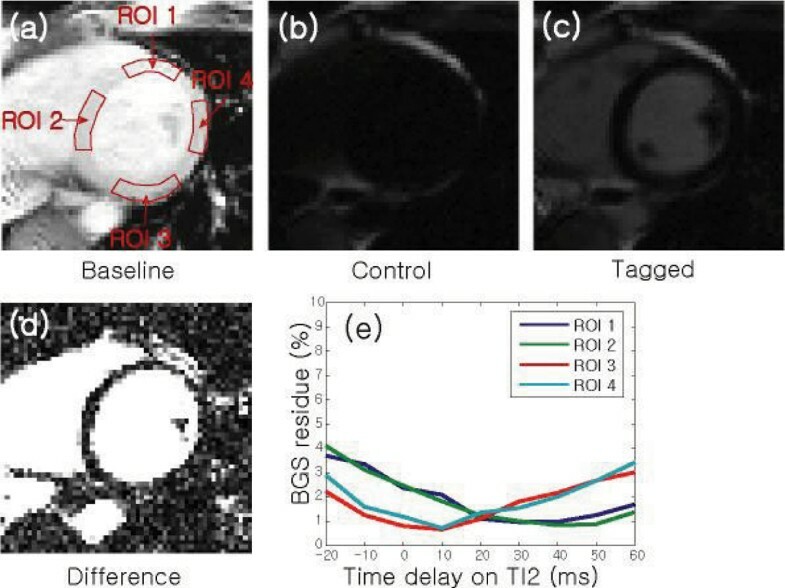 (a) Baseline, (b) control, (c) tagged, (d) difference images on a short-axis view, and (e) BGS residue as a function of time delay on TI2 for each ROI. The same display level was used except for difference image. Background suppression is expected to reduce the effects of mis-registration and ringing in subtractive ASL imaging. The spatially varying BGS is likely due to B1+ inhomegeneity. Despite the use of adiabatic pulses, simulations (not shown) indicate that B1+ variation can lead to a small spatially varying signal residue. Current results have limited SNR, and would benefit from signal averaging using multiple breath-holds or respiratory navigation (work in progress). Improved BGS may eventually allow for non-subtractive ASL.